Monday in Incheon, Korea, The Philippine Men's National Basketball Team faced the Asian powerhouse China for the 5th - 8th place classification round of the 2014 Asian Games basketball tournament. 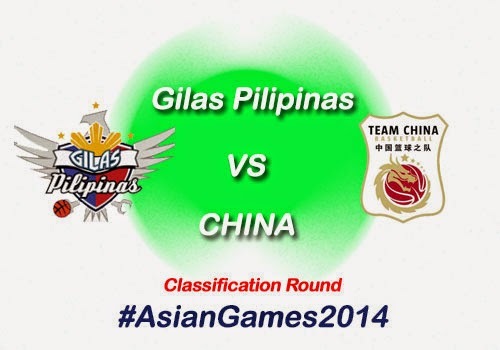 But sad to say, Gilas Pilipinas was defeated by China in 7 points (78-71) and failed to get the 5th place award. The team can only make it to the 7th place, the highest it can finish in the Asian Games 2014. According to Interaksyon, "Gilas played the game without Jimmy Alapag and Marc Pingris, who are both suffering from injuries." In addition to this, Tenorio and De Ocampo combined to score the last five points of the game but it wasn’t enough. China (78) – Liu 16, Zhao 14, Zhai 13, Li 13, Guo 10, Zhou Q. 6, Zhou P. 3, Wang 3, Sun 0, Ding 0. Gilas Pilipinas (71) – Douthit 24, De Ocampo 14, Tenorio 7, Dillinger 7, David 6, Norwood 4, Aguilar 4, Chan 3, Lee 2, Fajardo 0. For more information about the Gilas Pilipinas vs China Classification Game Results, kindly bookmark this page and share to your joined social networking sites. Comments or suggestions about "2014 Asian Games: Gilas Pilipinas vs China Classification Game Results, Highlights & Video Replay" is important to us, you may share it by using the comment box below.